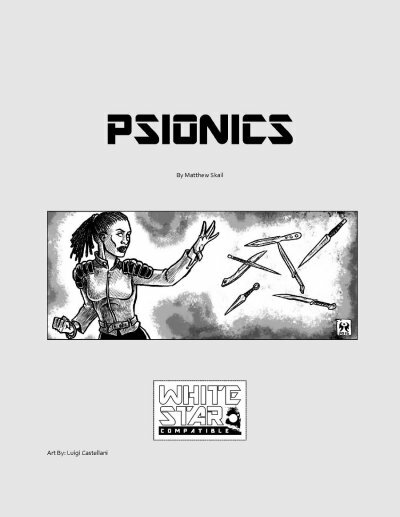 Psionics and Psionics II are supplements for the sci-fi OSR game White Star (aff). White Star has two "magic" classes, the Alien Mystic and the Star Knight. The Star Knight feels very much like a Jedi Knight from Star Wars. The Alien Mystic is something similar with a different list of "spells". And as you can see by my reference, both the Star Knight's Meditations and the Alien Mystic's Gifts use basically the D&D Vancian Magic system as the game is derived from Swords & Wizardry WhiteBox. They both have a list of Meditations/Gifts they can prepare like a D&D Magic-User. The Star Knight can use Charm Person, Healing Meditation, Read Languages, Speak With Animals, Alter Reflexes, Confusion, Heal Other, Neutralize Poison, Telekinesis etc. The Alien Mystic can use Hold Portal, Purify Food & Drink, Levitate, Fly, Alter Time and more. If you're looking for an alternate way to use powers in your game or the Jedi Knight flavor doesn't suit you, you might want to take a look at Matthew Skail's supplements. I received free PDF copies for reviewing purposes. I haven't had the chance to playtest these new characters, so this is a reading review. The supplement details a new class, the Psion. It's similar to the Star Knight which is understandable given the aim of this class. It goes up till level 10, but the XP-requirements are slightly lower than the Star Knight. It's somewhere between the Mercenary (the standard fighter) and the Star Knight. Weapon and armor restrictions are also comparable to the Star Knight, however, the Psion can't use shields. All in all, the class reminds me a bit of a mix between a Cleric and a Magic-User. Why Cleric? The Psion has access to a number of so-called Disciplines. Disciplines are scaled in level. The author created a level-less "spell system" (yay for none-vancian magic!) where higher levels in this class grant the Disciplines more power. A level 1 Psion has access to 1 power and can use it once per day. A level 8 psion knows 5 powers and can use them 8 times per day. Actually, I'm not really clear if the Psion has to choose which power to learn at each level or if he can use all powers. The class table has an entry for "Powers Known" but the section about the Disciplines tells us that "they are all available from first level and simply grow in power as the character gains levels". Thus, I stand by my notion that the Psion is a bit like a Cleric in that he has access to all powers. Furthermore, the Psion chooses a Focus at the start of play. He has to determine his Focus once and can't change it. This is a "minor" power that doesn't count against his daily uses. Examples include "Sensitive: gain +1 to AC; Initiative, Saving Throws & avoiding Surprise" or "Telepathic: contrate 10 minutes and sense thoughts within 60 ft, target can resist with a Saving Throw". Although these talents are billed as minor, they are pretty useful. Plus, they are quite handy as they can be used at-will. Let's get back to the Disciplines. Matthew Skail has created 11 Disciplines for the Psion, quite a lot. There are cool things like Biomastery which lets you raise your Armor Class or heighten your reflexes. You can also Cloud Minds where you can make others ignore you. As an attack power, there is Mind Assault which always does damage, save only halves it. At level 1 your damage is 1d6+1 and each level grants you a pool of d6s. With these you can empower the attack, for instance, you can spend dice on making the attack a cone or to strike only selected targets. There are also some powers which might be problematic for the GM to incorporate without breaking the adventure, for example, Meta-portation which allows the Psion to translocate to spaces he has seen before. Granted, at level 1 they can only transport 10 lbs at a range of 50 ft but at level 6 it's already 1 mile and 500 lbs. And that's where I see problems with this class. Generally, the Psion is very interesting but I assume that he is pretty powerful. His XP requirements are lower than the Star Knight, but he is way more versatile with his choice of Disciplines. Some powers are very impressive and from reading this supplement the Psion looks like he's a much more interesting class than the Star Knight. All in all, this is a serviceable looking product but nothing spectacular. I find it a bit hard to rate this supplement. On the whole, the new class is very appealing and I especially like the level-less powers. However, I have the impression that the Psion is too powerful for his own good and might overshadow other classes: he can choose between a whole lot of powers right away (beginning from level 1 whereas the Alien Mystic and the Star Knight access their powers at level 2) and the foci are also very versatile. The price point is fair but on the upper range of White Star supplements (yes, that's true, most cost between USD $1.00 and $1.99). I'm giving this a 4/5. This supplement is similar to the previous one. 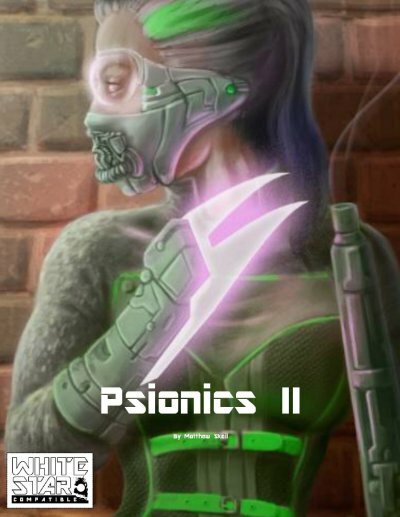 The author created two new classes: the human Psionic Warrior and the Alien Psionic Warrior. They resemble the Star Knight more than the above mentioned Psion. The Psionic Warrior uses the same XP table as the Star Knight which seems fair. Weapon and Armor restrictions etc. are also very akin. The Alien Psionic Warrior caps at level 8 but his XP requirements are considerably higher than one of the standard Alien Classes. He gets Alien Racial Benefits depending on what species you choose. For example, the Avians are winged and can fly and the Armed have some kind of natural weaponry with 1d6 damage. There are 11 species to choose from. Both classes have Warrior Focus: at 1st, 4th, 7th and 10th (for Humans) level they gain one point of Focus, i.e. Reflexes (+1 to AC), Speed (+3 Movement) or Accuracy (+1 To Hit). Both classes have access to Disciplines. These psionic powers are very similar to the ones mentioned in "Psionics". There are 13 powers which are level-less. They raise in power or accuracy as the character gains levels in his class. However, differently from the Psion, these powers have a level cap/limitation. For instance, the power Akashic Meditation (a catch-all for a sense power where you can choose between sense evil or sense traps or detect poison etc. (10 options)) is limited to level 5. Like the Star Knight the two classes can use these powers from level 2 on (not like the Psion who can access Disciplines as a starter character). Again, I'm not really sure if the classes have access to all powers beginning from level 2 as the text is a bit unclear on that. Anyways, use of Disciplines is limited per day depending on your level. Generally, the powers mostly overlap with the supplement "Psionics". But the classes mentioned here have access to a Psionic Blade and can Imbue Weapon which fits the warrior theme better. As a bonus, the product contains an appendix for Wild Talents with two possible ways to incorporate them into your campaign. The idea is that normal people can have innate psionic powers, so called Wild Talents. This option provides the opportunity to add a template to an existing class. Thus you can play a "normal" class like a Mercenary and add psionic powers. The "new school method" is more balanced and comes with an own XP table where you can "buy" talents for a number of XP. The "old school method" is much more random and asks you to roll on a table to determine your Disciplines. This appendix is a very neat idea and definitely an option if you don't want to add the fully fleshed out Psionic classes. Look and feel of the PDF are comparable to the first product. The fonts are easy to read and the layout is spartan (which is not a bad thing). The artwork varies in style which I don't find that pleasing. It would have been nice if the author stuck to one style like he did in his first supplement. Overall, I'm very pleased with this product. The classes seem to be a bit more balanced than the Psion but they are still very powerful. I especially like the appendix options. While you get a lot bang for the buck, the product's price (USD $2.99) is on the upper range of White Star supplements. I'm again hard pressed to rate this and also decide on a 4/5. If you're dedicated to include psionics in your game this is really nice. Still, it's comparably pricey and the classes are not without problems regarding balancing issues. Yet a very good product and only a small step away from a 5 star rating.